Sylvie, this is absolutely stunning! Fabulous card... we really got your creative juices flowing this morning didn't we! Gorgeous, I really like it. I wasn't sure about adding a message to mine either! Sylvie this is absolutely beautiful! Beautiful card - isn't white on white spectacular? Stunning, what a clever use of little white flowers. Ooh Sylvie, Ive just received a new craft book and this card is the one that made me buy it! It looks sooo beautiful! 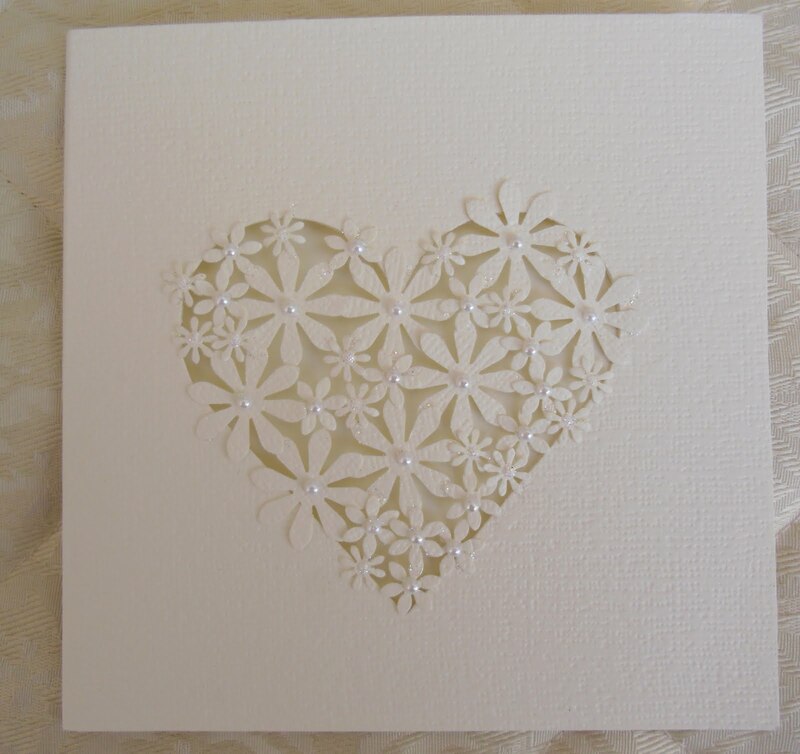 I love it, stunning card, I am going to try to do one similar, but not a heart and with snowflakes, the emphasis being on try. So romantic and pretty...I better get started...everything I've seen so far is lovely. I am still playing catchup in blogland at the mo, I have enjoyed looking round your blog to check out all that I had missed, so many very gorgeous things!!! I love this card, I love WOW it always look so luxurious!! and this is just so soft and romatic too, gorgeous card!! Gorgeous, absolutely gorgeous. When a card is this creative and beautiful, a sentiment isn't needed. This lovely card stands on its own. So gorgeous, a perfect wedding card methinks! Wow this is stunning - a gorgeous LiM entry! I love the deatail of those fab flowers over your heart - Love It! Sylvie this is truly magnificent! So glad you were excited! This is so beautiful. I thought at first you had used a stencil but I realise now they are individually placed flowers-great work. 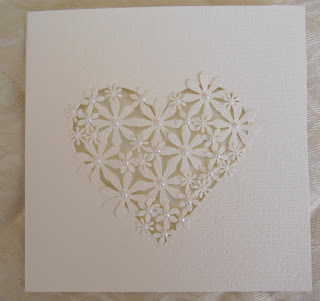 I love this one its simple but elegant, think i need to invest in more flower punches. I wish we had your sunshine. Stunning card Silvie. Really effective. Beautiful card - nice flowers ! Absolutley stunning! I love the flowers and gems in the heart - beautiful!! Sylvie...this is stunning! I love it! I can't tell if you put acetate behind the flowers or not...but it's gorgeous and SO unique! Oh my goodness another stunning card, this would be so perfect for a wedding card. My favourite card so far! Simply stunning. what a stunning card, it has so much style! Stunning card , so so pretty and a very intricate design too, very classy piece. so intricate, beautiful and creative - great design! What a lovely idea, although I imagine it was quite fiddly to put together. It looks fantastic. Gorgeous card. No sentiment needed, in my opinion. It's beautiful just as it is! OMG this is absolutely stunning I LOVE it what a fantastic creation Sylvie. Might have to store that in my memory bank and have a go one day! QVC: Yes I did hear you on QVC talking to Julie and you didn't sound nervous at all - lovely to hear your voice! I was watching it about 45mins behind re "live" time as a friend had popped in for a coffee and I missed a couple of items that I was interested in as most of it flew out the door! Absolutely gorgeous, I love it as it is. Just breathtaking! I love all three of your cards, but this is my favourite!